Arrived on time with West Jet. Customs took a long time to get through, about one hour. Once we checked in we attended a group welcome dinner. The room was decorated beautifully with an “Around the World Theme”. The food was amazing as always. Thursday morning I attended meetings from 8:30 am to 3:30 pm. There is about 200 travel agents attending plus guests. We attended a beach barbecue at the El Dorado Maroma Resort where they had a spectacular display of food on the Marina Beach. Again ate way to much! Friday was a beach party at the Casita’s where they served food, drinks and played Reggae music. The Gala Awards dinner is tonight which I will be attending. Must go now to get ready! The weather is beautiful, hot and sunny 30 degrees. We are currently at a cardamom/coffee plantain in Munnar Kerala. On Saturday November 5th we rented a vehicle at the Marriott and went to the airport to pick up Savita who was arriving at 11:30. We were a bit concerned as after an hour she was still not out, apparently the custom guy has a bit of an issue with her passport–she has an indian name Savita but doesn’t speak Hindi, she was coming from England but has a Canadian passport etc. Actually, she said that he was young so I am sure he just wanted to spend some time talking with him! We asked her if she was okay with touring Bombay right awayS(from the airport) as this was her only opportunity to do so, she agreed so we went on a tour of Mumbai with her. It was great to have Larry give her a commentary on Mumbai–Dhobhi Ghat, Victoria station, Gateway to India, Taj hotel, etc etc. We went for a nice lunch and after a while she said that she was falling asleep so we brought her back to the hotel, where she fell asleep and Larry and I went for a bit of shopping. We checked out really early on Sunday for flight to Kochi where our tour with Splendour holidays started. We were picked up by a nice air conditioned car and driver and went straight to Allepy and a fantastic houseboat, where we stayed overnight and relaxed and ate and relaxed and ate! This morning our driver picked us up and drove us to Munnar where we are this evening. Kerala is experiencing monsoons so we have had rain each day a first time for me in India. We just had Ayurvedic massage (Shai/Mum/Dad– thought of you again today) so we are a bit zoned out. We are fine and doing okay. Tomorrow we tour Munnar and then the next day, we are off to Kochi. It is great to hear that everyone from the India tour is back in Canada, I am glad that everyone is safe and sound. After I received the emails from everyone, I think I had the best sleep. I am happy to report that except for one day that Blaine didn’t feel well, we didn’t have any other major illnesses (my biggest fear). I can’t believe that I haven’t written for so long…needless to say, the whirlwind tour has had me very busy. After Jaipur/Diwali, we drove to Jodhpur. We arrived to a lovely Gateway Hotel in Jodhpur and fell asleep early. The next day, we toured the fort in Jodhpur which was really nice. Unfortunately, the King of Bhutan was also visiting the fort so the place had been closed in places till he went through causing a bottleneck of tourists. I guess there were many wars between gujrat and Jodhpur kings and there is a lot of “booty” and other gifts from war wins in the fort. The place was full of gujratis on their diwali vacations. Jodhpur is a “blue” town unlike Jaipur which is pink. The residents of Jodhpur paint their houses blue to keep the insects away. So when you look at the town from the top of the fort, it looks blue. One of the couples travelling with us (Rod and Linda) got a text message just as we were leaving that they were the proud grandparents of a girl so there was a lot of celebrating that evening. After Jodhpur, another bus ride to Udaipur. The hotels where we are staying are very nice and beautiful but by the time we reach them at eight or nine, we have a quick supper and then bed and we leave the next day, so not much use of the nice facility. Udaipur palace was also full of gujratis…we went on a boat ride after looking at the palace and had lunch on the island hotel, It was quiet and lovely. We didn’t check out much as in Udaipur as we had to drive to Ahmedabad…another long ride. The people were pretty tired by then. We reached Ahmedabad really late, bed and left at 6 a.m, the next morning for our flight to Mumbai. Sorry, didn’t make any call to anyone. goodbyes at the hotel as they do not let you in the airport without a ticket. This morning it was lovely without 12 other people around us. We had a quiet breakfast and then went to the newest movie in town–Ra One in 3 D. Larry liked all the action scenes. Now we are at the Marriott and await Savita’s arrival on the 5th. The tour was very successful and everyone had a great time. How are things in Canada? Is everyone doing fine? On Wednesday, I flew into Palm Springs for the first time. As usual, the flights with Westjet were great and on time -very uneventful (which is a good thing when flying!). Having never been to Palm Springs before, I wasn’t sure what to expect. Flying into Palm Springs, all you could see from the air in any direction were ugly, dry, brown hills and mountains. It didn’t look that appealing. It’s funny how much your perception can change once you’re on the ground and getting a different perspective. Palm Springs is a lush, green oasis in the desert. There are gorgeous resorts, palm trees, and green grass everywhere. The mountains look quite majestic and provide a great back drop to the resorts. Other than the lack of beach and ocean, you could totally feel like you were in some tropical beach resort as you lay around the swimming pool. Our host resort, the Rancho Las Palmas, is about a $35 cab ride – or 20 minute drive from the Palm Springs Airport. They have recently had a $35 million renovation to the rooms and will soon be renovating their ball room areas as well. They have nice, big rooms – everything is built and decorated in the Spanish Hacienda style. They have three swimming pools and two hot tubs. One pool is adults only, the other is a family pool. The third pool area is Splashtopia – a kid friendly area with waterslides, splash park and a lazy river. It would be a nice resort for families with small children. We have had three meals at this resort so far and all were excellent. Our balcony overlooks one of the golf green, as well as a pond which is always full of ducks. It’s very pretty. 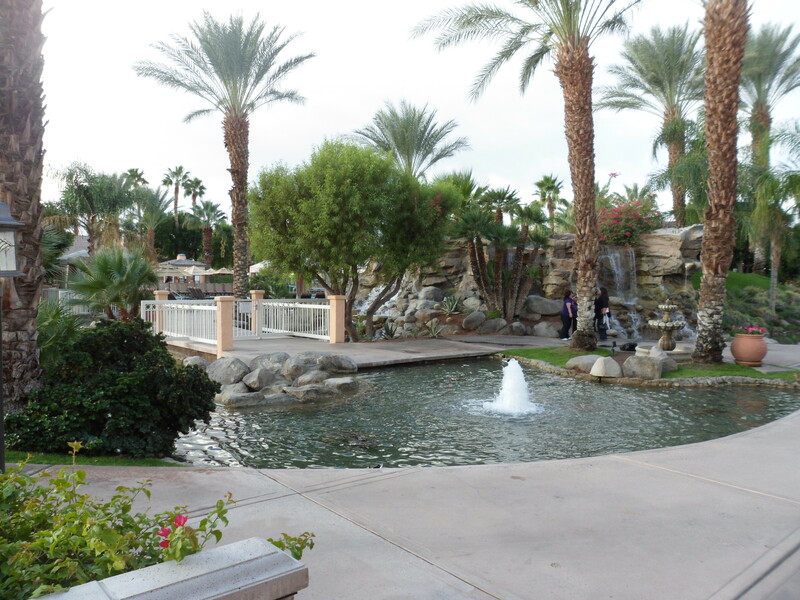 We also visited the La Quinta resort – part of the Waldorf Astoria collection. Although it was getting dark when we arrived for dinner, we were treated to a gorgous sunset that show cased the pretty mountains right behind this 45 acre resort. This historic resort was built in the 1920’s and has had more than it’s share of famous hollywood guests. The hotel has kept a lot of it’s original architecture – it’s full of antiques and huge wood burning fire places. It is gorgeous and comfortable. It would be great for groups as they have over 40 swimming pools and each pool has several villas overlooking it – so your group could potentially have their own swimming pool to gather around. It would also be a wonderful place for weddings and for golfers – they have 5 courses on site that are available to their guests – plus some other private courses. One of their golf courses is rated 1 in California, 4 in the US and 9th in the world. Very pretty – I would definitely return. The third resort we saw was the Westin Mission Hills. Another gorgeous, large property with two golf courses. The staff were wonderful and welcoming and they treated us to some time in their spa, which was heavenly. It’s a full service, high end spa with private steam rooms, hot tubs and every amenity you could want. The rooms were large and typical of Westin. We had a few hours to experience the Cabazon and Desert Hills outlet malls yesterday. Unfortunately, they were open air and the weather didn’t cooperate, so we were running through a bit of rain and wind from time to time. Otherwise, the shopping was great. Some good deals to be had and we all came back with serveral bags and a few dollars poorer 🙂 I wish we would have had more time as there was one whole buiding we didn’t get a chance to check out. Next time! The outlet malls are about a 30 minute drive from our resort – a taxi is about $75-$100 dollars or there is a shuttle that goes twice a day and comes back twice a day for $25 per person per direction. Luckily we hopped in and caught a ride with another member of our group who had a car. Last night was Marks birthday, so we went to a nice restaurant within walking distance of the Rancho Las Palmas called Roy’s. It was a great restaurant. The service was good – very attentive. The food and wine were also exceptional – especially the chocolate Souffle for desert. I had let them know ahead of time that it was Mark’s birthday and every person we saw from the hostess to the bus boy to the waiter wished Mark a happy birthday. His menu had a happy birthday note tucked into it and they brought him a special happy birthday desert of a macadamia nut tart. I would definitely recommend it – most entree’s were between $25 and $35 dollars. I’m looking forward to this afternoon – the weather forecast is for 20 degrees and sunshine. We are heading out on a jeep tour through the desert along the San Andreas fault, ending with a BBQ dinner.